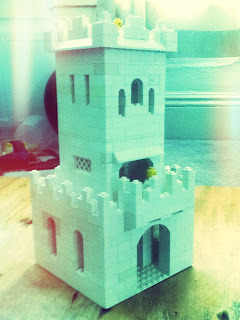 Here's what the castle ended up looking like. It reminds me of the Moorish outposts along the Tejo in Lisbon. We've been looking online at different organizing techniques and projects that other adult Lego fans have posted. It's quite an interesting world. And there, Lego pluralized is still Lego. Who knew? Very impressive. Jesse has skilz! Maybe you'd find it useful, too? I just can't say Lego for the plural.I can't. definitely cool. and it makes me feel younger to know my kids are still playing.